In last week’s poll we asked for your opinions on the greatest challenges to vehicle autonomy and the results point firmly to legal rather than technological barriers. Out of 414 votes, just over a third (34%) took this view, closely followed by 29% who thought detection and avoidance were the biggest technological hurdles to overcome in vehicle autonomy. 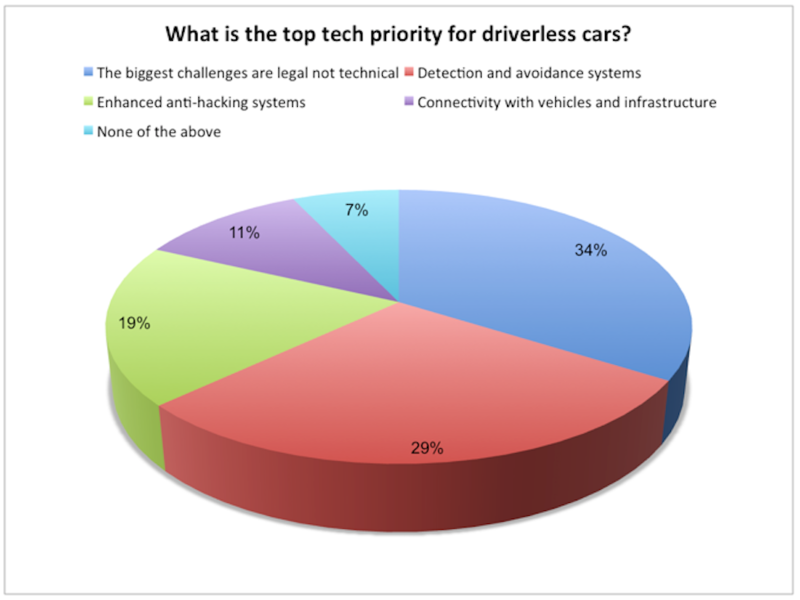 A total of 78 votes (19%) were cast in favour of enhanced anti-hacking systems, and 44 votes (11%) took the view that connectivity with vehicles and infrastructure is key to autonomy. The remaining 7% thought the challenges to vehicle autonomy remain elsewhere, opting instead for the ‘None of the above’ option. What do you think are the greatest barriers to vehicle autonomy? Let us know by commenting below. Surely the legal aspect will be relatively simple. Unless caused by a manufacturer’s fault, by using an autonomous vehicle, surely you are accepting responsibility for its actions if not directly then by proxy. If you are not prepared to do so, you should continue to drive yourself . . . Reliability & safety of the control systems, including ‘hacking’ vulnerability, will not be able to be guaranteed & make public acceptance & therefore governmental acceptance unlikely & inadvisable. Legally, could I rely totally on the autonomous vehicle to take me home from the pub after a few pints too many? In other words, would I be in charge of the vehicle, or would the vehicle be in charge of me? None of the above. The biggest hurdle will be public acceptance. The requirement for longstanding drivers of the “I don’t want to let the car be in charge variety”, that will be trying to overcome the control systems to “Avoid” situations. This will ultimately drive the Legal challenges. “A Cat ran out into the road unexpectedly and the car decided that it was safer to drive over it than avoid it By swerving into the cyclist to the left, I was traumatised”, and other such scenarios. Once the public are trained to accept that the car will avoid emergency situations more successfully than any human, will take better emergency action before a human could have, manoeuvre the car much better and closer to the operational envelope in an emergency than a human could, and will always take the path of least danger as determined by large amount of testing (and prior litigation) then people will wonder why they ever wanted to drive the things anyway. It is like the old story that in 30 years time the normal civil airliner cockpit will contain a man and a dog, the dog will be there to bite the man if he is touching the controls. The man will be there to feed the dog! “Once the public are trained to accept that the car will avoid emergency situations more successfully than any human” Presumably if they don’t accept this “fact” they will be required to attend psychological re-profiling and/or receive a frontal lobotomy to address such unacceptable deviance. Would I send the kids to school in it, knowing that if there were a small accident, everything could work out fine. Would it be my car, or would it be hired just for the journey? Imagine a rental car turning up outside my house just for the one-way journey to school. The social/legal changes are huge. Driverless cars are a distraction. What we should be aiming for is safe, reliable, environmentally friendly, low cost public transport. The time when a fraction of the population can squander the earth’s resources on a car for everyone is passing. There is no way driverless cars can anticipate our stupid and irresponsible drivers. the reaction may cause other dangers. Also with the reliability (or rather not) of car electronics, when these cars get older the risk is just too great, unless duplicate control systems are used (like in commercial aircraft). The technology would be better used elsewhere. And do you really think that drivers are better? I recently saw a video of a real accident where two cars collided head-on. Amazingly, neither driver made any attempt to avoid the accident. A driverless car would have done better. The easy answer to older systems becoming unreliable is to force everyone to replace their car every 10….. 5…… 3… 2 years. Already certain municipalities are looking at a projected drop in revenue from driverless cars not breaking laws. Meaning fewer speeding tickets, and bad driving citations. I would say that letting a car drive, brake and park itself is already here. I had a drive in my brothers Tesla at the weekend and it does all of these things (even on winding country roads) and is legal on the road. At 82 my days of driving must be numbered. An autonomous car would extend my freedom to get about. Public transport will never substitute for a car : I’ve tried over many years. My recent experience of two 80+ travellers returning to the North from Heathrow with 20kg suitcases on the London Underground was appalling : some connections do not have either a lift or an escalator. Fellow passengers were very helpful but we swore never to try it again. A rented autonomous car would be brilliant. I want to see how they will work round the narrow lanes of Devon and Cornwall, where you have to brush against the hedge to squeeze past a car coming in the opposite direction at the same time avoiding dropping into the ditch. Driverless cars will simply stop because they think there is not enough room – “Computer says No!”. Result? Total blockage that needs a person to unblock.